Structure.Panels and frame are made from galvanized steel protected with polyester powder painting to ensure total resistance to atmospheric agents. Compressor.3-phase scroll compressor model 14-30 with built-in thermal overload cut-out and crankcase heater, mounted on rubber vibration dampers. Evaporator, condenser. High efficiency plate (model 5-30) and tube-in-tube (model 38-140) type exchanger, factory insulated with flexible close cell material. Refrigerant circuit. Copper tube connection with charge valves, filter drier, thermostatic expansion valve (capillary for model 5-14), gas-liquid separator, high pressure switch and low pressure switch. The heat pump unit is completed also with 4-way valve, liquid receiver and one way valves. Hydraulic circuit. Built with user side and source side water inlet/outlet connectors, water discharge connectors, air vent valve, model 5-30 the user side is complete also with expansion vessel, water pump and flow switch. * Source side water inlet/outlet temperature 18°C/29°C, user side water inlet/outlet temperature 12°C/7°C. 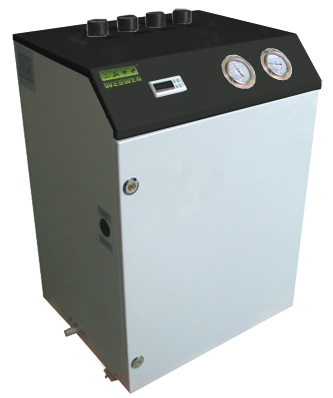 ** Source side glycol inlet/outlet temperature 15°C/8°C, user side water inlet/outlet temperature 40°C/45°C. *** Sound pressure measured at a distance of 10 m and a height of 1.5 m above the ground in a dear field.